Definition at line 30 of file ClientInfo.h. Definition at line 55 of file client_db.cc. References addr, buf, debugs, hash_link::key, MAX_IPSTRLEN, Ip::Address::toStr(), and xmalloc. Definition at line 336 of file client_db.cc. References debugs, hash_link::key, NULL, quotaQueue, and safe_free. Adjusts nleft to not exceed the current bucket quota value, if needed. Definition at line 1374 of file comm.cc. 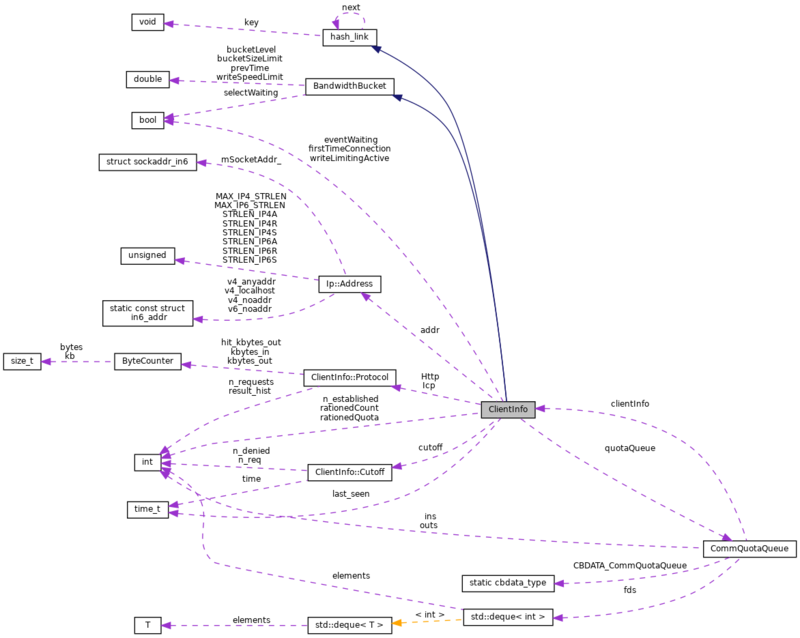 References BandwidthBucket::applyQuota(), assert, Comm::IoCallback::conn, Comm::Connection::fd, hasQueue(), kickQuotaQueue(), quotaDequeue(), quotaEnqueue(), quotaPeekFd(), and Comm::IoCallback::quotaQueueReserv. Definition at line 1284 of file comm.cc. References assert, CommQuotaQueue::empty(), and quotaQueue. Referenced by applyQuota(), commHandleWriteHelper(), and kickQuotaQueue(). Definition at line 1291 of file comm.cc. Definition at line 1330 of file comm.cc. References BandwidthBucket::bucketLevel, commHandleWriteHelper(), eventAdd(), eventWaiting, hasQueue(), quotaQueue, and BandwidthBucket::selectWaiting. Referenced by applyQuota(), onFdClosed(), reduceBucket(), and scheduleWrite(). Definition at line 41 of file BandwidthBucket.h. Referenced by MessageBucket::quota(), BandwidthBucket::reduceBucket(), and BandwidthBucket::refillBucket(). Definition at line 1397 of file comm.cc. Definition at line 1343 of file comm.cc. References BandwidthBucket::bucketLevel, debugs, HERE(), last_seen, quotaQueue, rationedCount, rationedQuota, BandwidthBucket::refillBucket(), CommQuotaQueue::size(), and squid_curtime. Definition at line 1323 of file comm.cc. References assert, CommQuotaQueue::dequeue(), and quotaQueue. Referenced by applyQuota(), and commHandleWriteHelper(). Definition at line 1315 of file comm.cc. References assert, CommQuotaQueue::enqueue(), and quotaQueue. Referenced by applyQuota(), and scheduleWrite(). Definition at line 1299 of file comm.cc. References assert, CommQuotaQueue::front(), and quotaQueue. Definition at line 1307 of file comm.cc. References assert, CommQuotaQueue::outs, and quotaQueue. Definition at line 1405 of file comm.cc. Definition at line 31 of file BandwidthBucket.cc. References BandwidthBucket::bucketLevel, BandwidthBucket::bucketSizeLimit, current_dtime, debugs, BandwidthBucket::noLimit(), BandwidthBucket::prevTime, and BandwidthBucket::writeSpeedLimit. Referenced by BandwidthBucket::noLimit(), MessageBucket::quota(), and quota(). Definition at line 1388 of file comm.cc. References Comm::IoCallback::conn, Comm::Connection::fd, kickQuotaQueue(), quotaEnqueue(), Comm::IoCallback::quotaQueueReserv, and writeLimitingActive. Definition at line 95 of file BandwidthBucket.cc. References fde::clientInfo, RefCount< C >::getRaw(), writeLimitingActive, and fde::writeQuotaHandler. Referenced by _comm_close(), Comm::IoCallback::selectOrQueueWrite(), Comm::Write(), and BandwidthBucket::~BandwidthBucket(). Configure client write limiting (note:"client" here means - IP). It is called by httpAccept in client_side.cc, where the initial bucket size (anInitialBurst) computed, using the configured maximum bucket vavlue and configured initial bucket value(50% by default). Definition at line 1414 of file comm.cc. References assert, BandwidthBucket::bucketLevel, BandwidthBucket::bucketSizeLimit, current_dtime, debugs, firstTimeConnection, hash_link::key, BandwidthBucket::prevTime, quotaQueue, BandwidthBucket::selectWaiting, writeLimitingActive, and BandwidthBucket::writeSpeedLimit. Definition at line 41 of file ClientInfo.h. Referenced by client_entry(), clientdbDump(), ClientInfo(), and snmp_meshCtblFn(). Definition at line 48 of file BandwidthBucket.h. Referenced by kickQuotaQueue(), MessageBucket::quota(), quota(), BandwidthBucket::reduceBucket(), BandwidthBucket::refillBucket(), and setWriteLimiter(). Definition at line 54 of file BandwidthBucket.h. Referenced by BandwidthBucket::refillBucket(), and setWriteLimiter(). Definition at line 71 of file ClientInfo.h. Referenced by commHandleWriteHelper(), and kickQuotaQueue(). Definition at line 66 of file ClientInfo.h. Referenced by clientdbDump(), clientdbGC(), clientdbUpdate(), and snmp_meshCtblFn(). Referenced by clientdbCutoffDenied(), clientdbDump(), clientdbGC(), clientdbUpdate(), and snmp_meshCtblFn(). Referenced by accessLogInit(), aclMatchExternal(), MemStore::anchorToCache(), Rock::SwapDir::anchorToCache(), cacheIndexCmp(), StoreMetaMD5::checkConsistency(), StoreEntry::clearPublicKeyScope(), client_entry(), clientdbCutoffDenied(), clientdbEstablished(), clientdbGetInfo(), clientdbUpdate(), ClientInfo(), Rock::SwapDir::createStoreIO(), CommQuotaQueue::dequeue(), destroyStoreEntry(), LeakFinder::dump(), CommQuotaQueue::enqueue(), external_acl_cache_add(), StoreEntry::forcePublicKey(), fqdncache_entry::fqdncache_entry(), fqdncacheAddEntry(), fqdncacheParse(), hash_join(), hash_lookup(), hash_remove_link(), hash_unlink(), StoreEntry::hashDelete(), hashFreeMemory(), StoreEntry::hashInsert(), hashKeyStr(), Rock::SwapDir::hasReadableEntry(), htcpQuery(), IdleConnList::IdleConnList(), idnsCallback(), idnsStartQuery(), ipcache_entry::ipcache_entry(), ipcacheAddEntry(), ipcacheRelease(), LeakFinderPtr::LeakFinderPtr(), Fs::Ufs::UFSSwapDir::logEntry(), Store::Controller::markedForDeletionAndAbandoned(), my_free(), ipcache_entry::name(), neighborsUdpPing(), net_db_name::net_db_name(), netdbHashInsert(), netdbLookupAddr(), PconnPool::noteConnectionRemoved(), Ipc::StoreMap::openForUpdating(), Rock::SwapDir::openStoreIO(), peerCountMcastPeersStart(), StoreEntry::publicKey(), read_passwd_file(), Ipc::StoreMapAnchor::set(), StoreEntry::setPrivateKey(), StoreEntry::setPublicKey(), setWriteLimiter(), snmp_meshCtblFn(), Ident::Start(), MemStore::startCaching(), storeDigestAdd(), storeDigestDel(), storeKeyPrivate(), storeRebuildParseEntry(), storeSwapMetaBuild(), UFSCleanLog::write(), Rock::IoState::writeBufToDisk(), ~ClientInfo(), ExternalACLEntry::~ExternalACLEntry(), fqdncache_entry::~fqdncache_entry(), IdleConnList::~IdleConnList(), ipcache_entry::~ipcache_entry(), and net_db_name::~net_db_name(). Definition at line 63 of file ClientInfo.h. Referenced by clientdbGC(), clientdbUpdate(), and quota(). Definition at line 62 of file ClientInfo.h. Referenced by clientdbDump(), clientdbEstablished(), and clientdbGC(). Definition at line 52 of file BandwidthBucket.h. Referenced by BandwidthBucket::BandwidthBucket(), BandwidthBucket::refillBucket(), and setWriteLimiter(). Definition at line 68 of file ClientInfo.h. Referenced by hasQueue(), kickQuotaQueue(), quota(), quotaDequeue(), quotaEnqueue(), quotaPeekFd(), quotaPeekReserv(), setWriteLimiter(), and ~ClientInfo(). Definition at line 70 of file ClientInfo.h. Definition at line 69 of file ClientInfo.h. Definition at line 49 of file BandwidthBucket.h. Referenced by checkTimeouts(), commHandleWriteHelper(), kickQuotaQueue(), BandwidthBucket::onFdClosed(), MessageBucket::scheduleWrite(), setWriteLimiter(), and Comm::Write(). Definition at line 65 of file ClientInfo.h. Referenced by scheduleWrite(), BandwidthBucket::SelectBucket(), and setWriteLimiter(). Definition at line 53 of file BandwidthBucket.h. Referenced by BandwidthBucket::noLimit(), BandwidthBucket::refillBucket(), and setWriteLimiter().